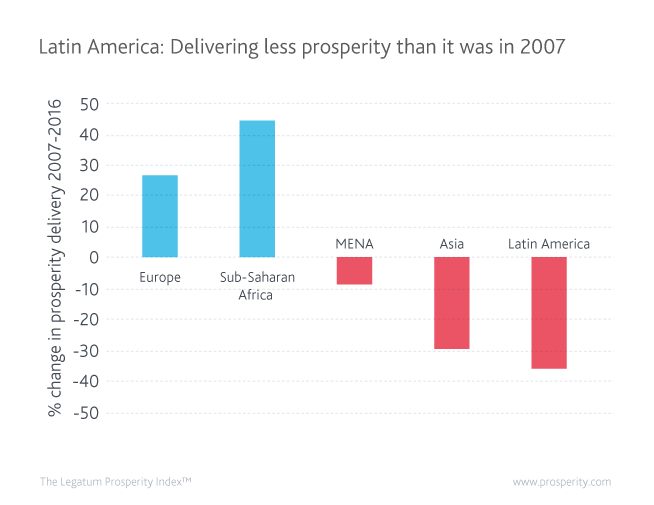 Why has Latin America not learned how to deliver prosperity? Unlike any other region in the world, Latin American prosperity follows the economic cycle. When economies are booming, so too is prosperity. As economies shrink, prosperity falls too. Why is Latin American prosperity so closely related to its economic fate? On the streets of Rio de Janeiro, a teenage boy was shot dead outside his home on his way to school. For denouncing the murder, the boy’s father was killed that same day. These were just two of the 4,000 killings that happen every year in Rio. Nearly as many people are murdered annually in Brazil as are killed in Syria’s civil war. Brazil is not alone. Latin America is the most violent region in the world: with just ten percent of its population, it has almost half of its homicides. Honduras is particularly badly affected, with the city of San Pedro Sula now earning the title of murder capital of the world. This absence of personal safety in the region speaks to a fundamental failure to provide the basic structural foundations of prosperity. 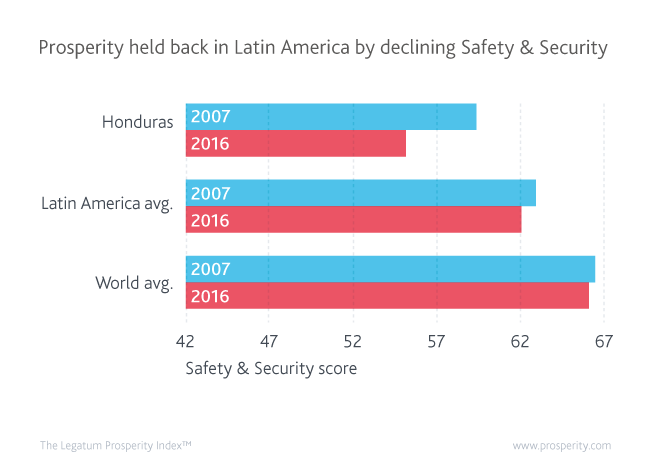 However, it is not just the safety of its citizens that Latin America is failing to secure. Governance in Latin America is fundamentally weak. The region has very low scores in government confidence and effectiveness. Just 37 percent of citizens in the region have confidence in their national government. Governance in Latin America is fundamentally weak. The region has very low scores in government confidence and effectiveness. Just 37 percent of citizens in the region have confidence in their national government. This compares poorly to the developed and developing world alike. In Europe, it is 41 percent and in Asia, 58 percent. Rule of law is the second lowest of any region in the world after Sub-Saharan Africa. Latin American prosperity is structurally weakened by the absence of strong governance foundations. Other foundations of prosperity are similarly absent. After Safety & Security, the region’s second worst global performance is in the Education sub-index, with a median rank of just 82nd. Poor education quality and low levels of human capital are limiting the potential for prosperity growth. The average Latin American worker has just 2.7 years of secondary schooling. Without structural foundations, Latin American prosperity is subsequently highly dependent on economic performance. When the economy is doing well, economic opportunity abounds, masking the challenge of poor education and weak governance. The result is that prosperity rises, though on shaky ground. With weak human capital, little can be done to help drive new sources of growth through innovation and entrepreneurship. Without basic effective structures of governance, government can do little to help lift prosperity. When the economy is on the slide, however, prosperity falls. With no structural foundations beyond the performance of the economy, prosperity gained is quickly prosperity lost. There is nothing in place to ensure growth can be sustained. With weak human capital, little can be done to help drive new sources of growth through innovation and entrepreneurship. Without basic effective structures of governance, government can do little to help lift prosperity. Crime rates rocket as people look elsewhere for opportunities, further harming the chance of progress. The whole fabric of prosperity generation breaks down. The effects of the recent slowdown in commodities-backed growth are already being felt in the region. Brazil’s prosperity is in decline, and Chile and Colombia are stagnating. Where prosperity growth is found, such as in Argentina, the rate of growth has been significantly curtailed. That Latin America has no real structural foundations for prosperity is most stark when we consider the extent to which regions have learned how to deliver greater prosperity with their wealth over the past decade. Just two parts of the world – Sub-Saharan Africa and Europe – have learned how to deliver more to their citizens with their economic wealth. The rest of the world is delivering less, but nowhere more so than Latin America. If Latin America is to learn how to deliver greater prosperity to its citizens, then it needs to begin by addressing the fundamental foundations of human flourishing. Unless its citizens are safe, educated, and governed by an effective and fair system of governance where the rule of law is supreme, then prosperity has no foundation in which to take root. Without the structural necessities of prosperity delivery, the fate of the region’s prosperity will forever be tied to the fate of its economy.